Working as a veterinarian can be a rewarding experience. They are in charge of the well being of animals as well as the humans who care for them. Vets diagnose diseases, treat injured animals and counsel owners about healthy lifestyles. The American Veterinary Medical Association (AVMA) reported 110,531 registered veterinarians in its membership as of Dec. 31, 2017. Out of these, 71,393 worked in some type of private practice including companion animal exclusive practices, mixed animal practices and equine practices. Just as there are many types of practices and reasons to become a veterinarian, there are also many reasons to consider career options other than traditional private practice. Here are some of the most popular alternatives vets should consider before committing to private practice. The duties of a public health veterinarian may be hard to understand. After all, veterinarians — as most people understand — are in charge of caring for people's pets. But this is a very different type of job. Public health veterinarians are tasked with protecting people and animals from animal-related diseases. More specifically, they ensure food safety, investigate disease outbreaks and inspect processing plants. They are employees of the federal government with excellent salaries, health care, paid vacation and additional incentives. Veterinary officers in the Commissioned Corps of the U.S. Public Health Service can be assigned to work in areas related to biosecurity, disease control, research, meat and poultry inspection, public health, and administration. Duty assignments are available with many major federal organizations such as the Centers for Disease Control and Prevention (CDC), National Institutes of Health (NIH), Food and Drug Administration (FDA), U.S. Department of Agriculture (USDA), and the Environmental Protection Agency (EPA). The USDA’s Food Safety and Inspection Service (FSIS), a partner of the U.S. Public Health Service, is the largest single employer of veterinarians in the United States. The FSIS employs more than 1,100 veterinarians to ensure public health through the implementation of food safety control measures. Most of these veterinarians are stationed in meat and poultry plants and conduct routine inspections in those locations. Some positions require the veterinarian have a Master's degree in public health. According to Glassdoor.com, the national average base pay for a public health veterinarian was $108,218 per year as of 2018. Veterinarians may play a role in the research and development of a variety of animal-related products such as veterinary pharmaceuticals, animal feed products, pet care products, and specialized veterinary equipment. They may also find positions with numerous companies that use animal subjects to test human drugs for safety and efficacy. Corporate veterinarians have the potential to earn extremely generous compensation for their services, especially if they are employed by large corporations. Veterinarians may also find employment as sales representatives or sales managers, particularly in the animal health field. Some customers prefer to deal with licensed veterinarians who have extensive credentials in the field. Regulatory veterinarians oversee the quarantine and inspection of imported animals. These vets work with many different kinds of animals. They test animals for transmissible diseases, and enforce animal welfare laws related to animal treatment and care during the shipping process. 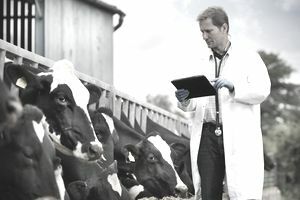 Regulatory veterinarians may be employed by a variety of agencies including the United States Department of Agriculture (USDA), Centers for Disease Control & Prevention (CDC), Food & Drug Administration (FDA), Department of Homeland Security (DHS), Department of Health & Human Services (HHS) or other agencies. Veterinarians with an interest in academia may find teaching positions with veterinary schools or undergraduate colleges and universities. In veterinary colleges, they will be responsible for providing a challenging professional curriculum for aspiring veterinarians. In other colleges and universities, they may teach undergraduate and graduate students pursuing degrees in animal science, equine science, livestock production or other closely related fields. Duties may include lectures, advising students, and designing hands-on lab activities with animal subjects. According to the U.S. Bureau of Statistics and Labor (BLS), the average salary for a post-secondary teacher was $76,000 in 2017. The salary range was between $39,040 and $170,160. The agency forecasted growth for post-secondary teachers to be 15% between 2016 and 2026 — much faster than the average occupation — because of rising enrollment in colleges and universities. According to AVMA, 6,878 of its members, or 40.9%, were working in academia in the U.S. as of Dec. 31, 2017. The U.S. Army Corps and U.S. Air Force employ veterinarians in areas such as food safety inspection, military dog and horse veterinary services, infectious disease control, and more. Military vets also provide routine healthcare for the pets of military personnel, animals used for research and animals used in military operations. Those who commit to military service are eligible for excellent benefits including paid education in specialty fields (including Masters and doctorate degree programs) and repayment of prior qualifying educational loans. Military veterinarians must meet height and weight standards, pass a physical fitness test and complete basic leadership courses. Veterinary students who enlist will also become eligible for a variety of scholarships and compensation packages. In the event a military veterinarian doesn't want to go into active duty, she can still serve in the army reserve. This gives the vet the option to continue working in a clinical practice or another veterinary-related career while undergoing military training and doing a two-week military training course once a year. Veterinarians may also find positions in many more areas such as shelter medicine, animal welfare, consulting, public policy, international transportation, and administration. It is important to remember that there are many avenues available to veterinarians beyond traditional private practice. While private practice is certainly a popular option, it isn’t for everyone. Don’t be afraid to explore all the possibilities after you secure that DVM degree.